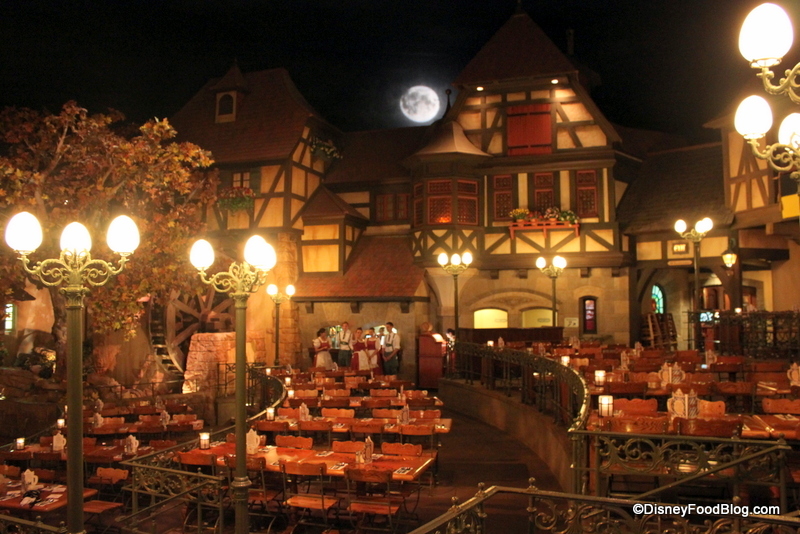 A favorite place to dine at Walt Disney World is Epcot’s World Showcase. With unique restaurants featuring tastes from around the globe, Epcot offers a smorgasbord of dining locations. Today, guest author Rebecca Elliott shares her dinner experience at the Biergarten located in the Germany pavilion. Prost! Epcot is designed to replicate a permanent World’s Fair with pavilions dedicated to innovation and international culture. Future World highlights technology while the World Showcase, on the other side of World Showcase Lagoon, celebrates international culture. There are 11 pavilions in the World Showcase, each themed and dedicated to a specific country. The décor can be old fashioned and kitschy, but the cast members, many of whom travel from their home countries to work in the World Showcase, give it an air of authenticity. The restaurants are by far the main attraction. Many pavilions have two or more restaurants that serve food inspired by their representative countries. I say “inspired” because the food is not necessarily authentic, but it has elements of authentic dishes and is served in a fun atmosphere with incredible theming. Instead of dining at our usual spot (Chefs de France in the France pavilion), my family and I decided to try something completely new on our most recent visit. 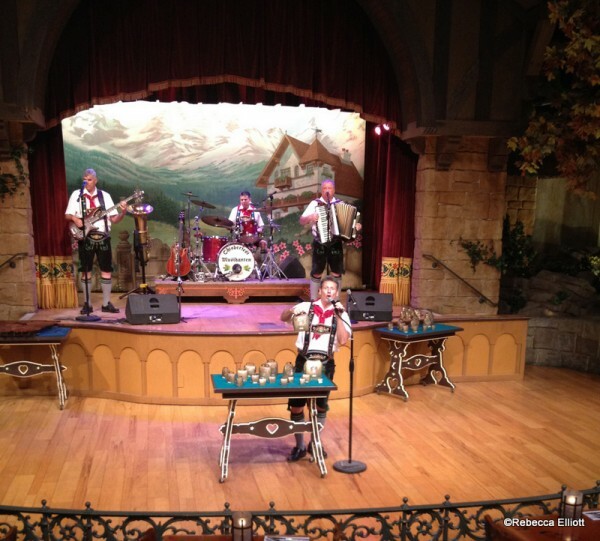 This is how we found ourselves at Biergarten in the Germany pavilion. 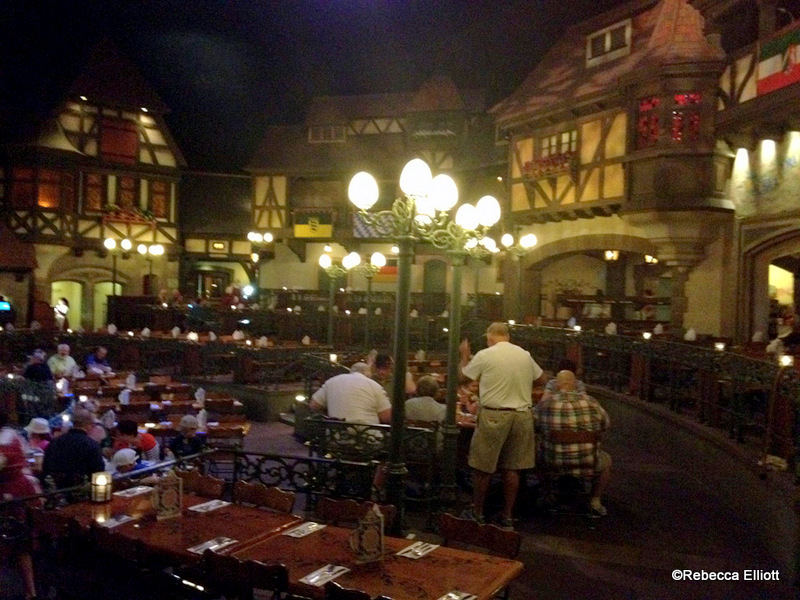 Biergarten is located in the back of the Germany pavilion, which is the fourth pavilion in if you enter the World Showcase from Future World and start from the left. Disney’s original plan was to feature a boat ride here, similar to the one at the Norway pavilion, but these plans fell through. The main entrance of the boat ride is now the dining area for Biergarten. 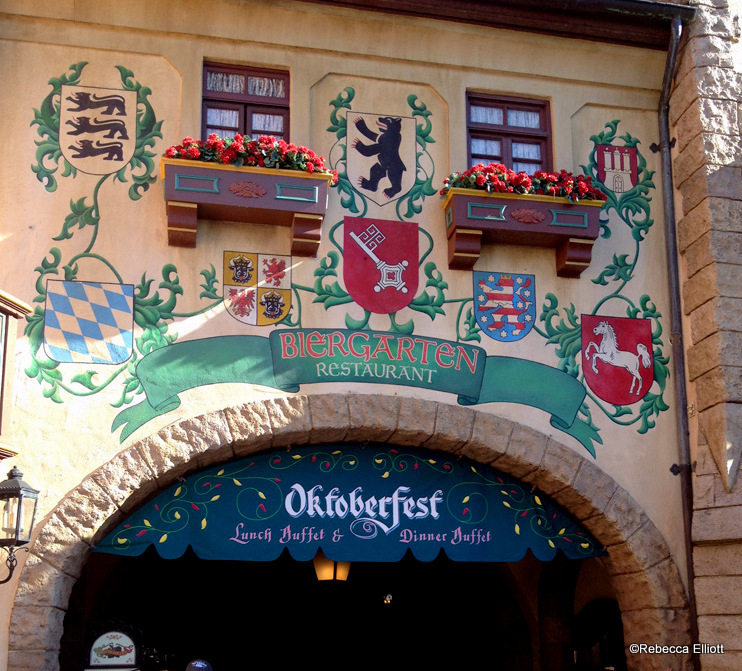 The setting for Biergarten is a quaint Bavarian village celebrating Oktoberfest. 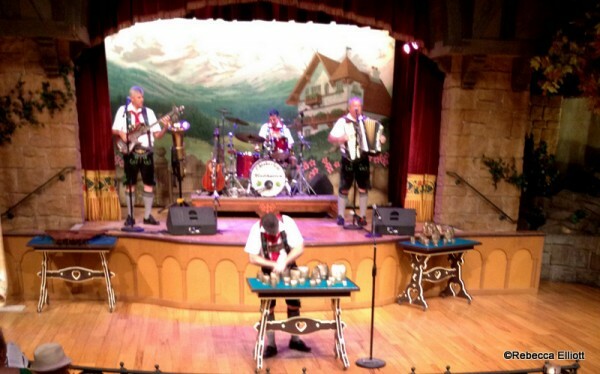 You are seated in the town square at communal tables, ready to enjoy traditional German music and food. It is dusk (no matter what time of day you eat), and the atmosphere is celebratory. We checked in with a cast member at the hostess desk outside the restaurant who reminded us that seating would be shared at communal tables and asked if we were okay with this. We said we were, and made our way to the waiting area. When our buzzer went off a few minutes later, we were corralled with two other families by a sweet hostess wearing a dirndl who reminded us again that seating would be shared. This was the second time since we arrived that we were told we’d be seated with people we didn’t know at our table. My family and I were fine with this. It seemed to lend itself to the Oktoberfest atmosphere and offered a fun way to meet other Disney enthusiasts. One of the families immediately had a problem when we were seated. They wanted to sit across from each other, but because of the odd numbers in the other families, it didn’t work out. My husband and I offered to break up our party, but they chose to go with the original setting and sulk instead. This bugged me, because we were told several times that we would be sharing a table. Why not go with the flow and join the fun? 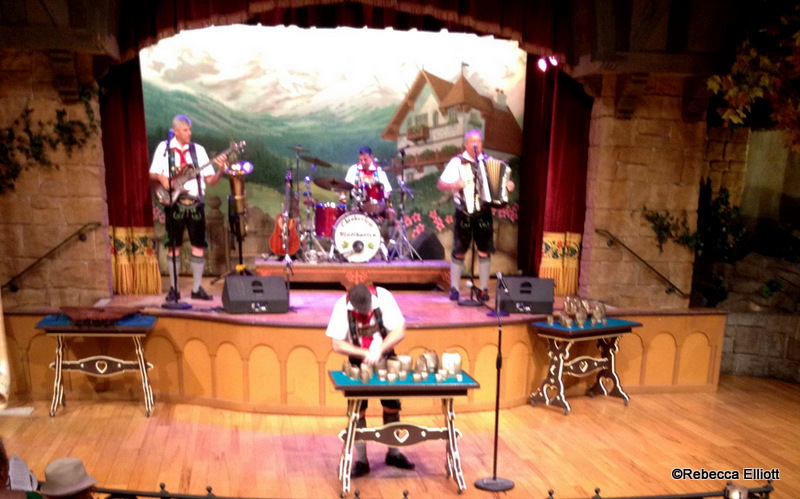 The whole time we ate, we were entertained by a traditional oompah band. I’ve heard that the same family has been putting on this show for years. They were a delight, playing all the traditional German instruments, including the accordion and the alpenhorn. They even played “It’s a Small World” on the bells. There is a dance floor in front of the stage, and the crowd is encouraged to sing and dance along. Children especially enjoyed this. We were quickly greeted by our server, a German gentleman in lederhosen who took great delight in explaining the buffet and describing the foods we could expect there. Before letting us loose, he took our drink order. 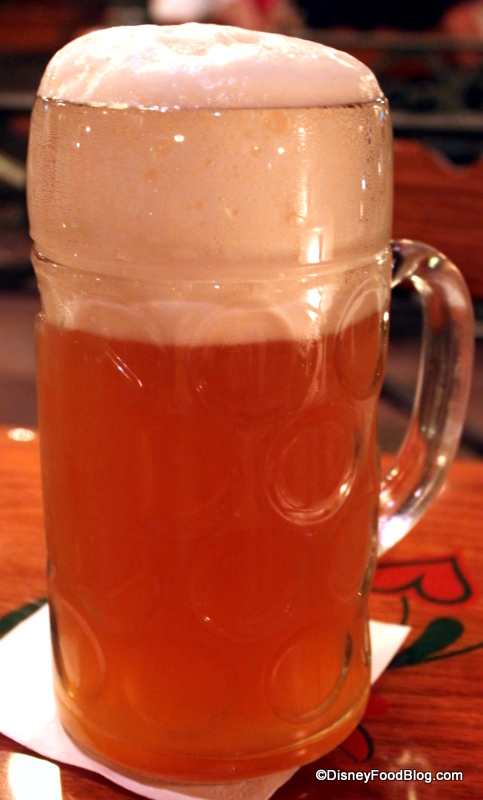 In true Oktoberfest tradition, guests were encouraged to order beer by the liter! Our tablemates did just that. We all headed to the buffet, which was stocked with traditional German food and some not so traditional foods to accommodate the less adventurous. 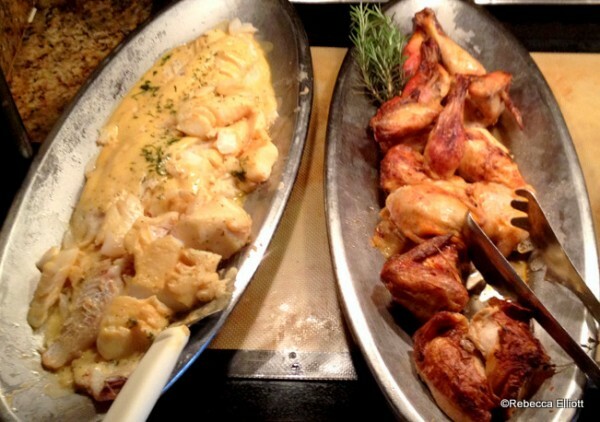 The buffet is two-sided, and the left and right lines are almost identical, so don’t be worried that you’re missing something on the other side. First up were the cold salads. There were several to choose from, with a variety of tastes and textures, from creamy and mild to crisp and tangy. 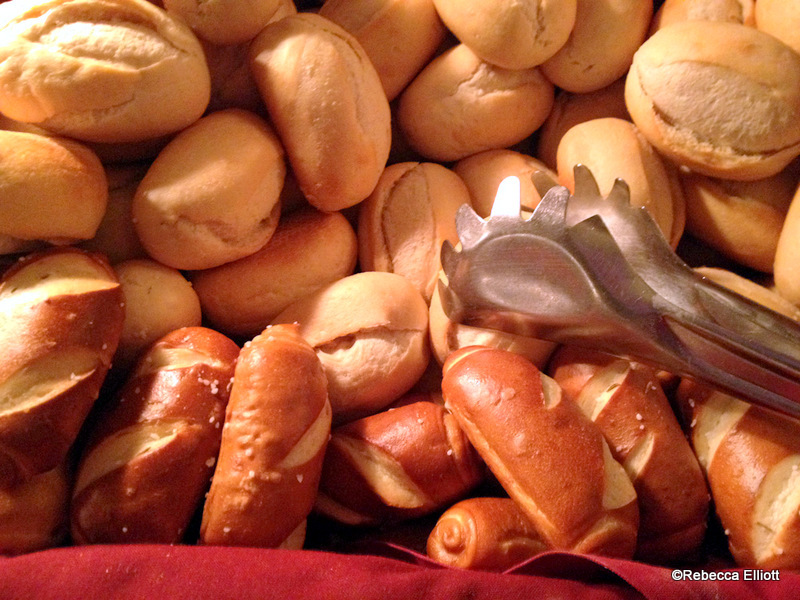 This is also where we found the rolls, including Biergarten’s famous pretzel rolls, which I swear I could eat by the basket full. Next came the hot items. Many traditional German dishes were represented, including schnitzel, spaetzle, rouladen, and different sausages with sauerkraut. There were also items like roast chicken and green beans for those feeling less adventurous. 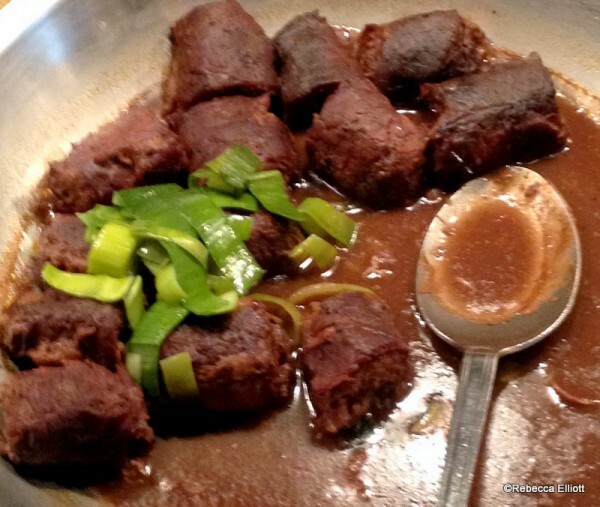 They needn’t worry – nothing is spiced too strongly. There is a nice selection of sauces and chutneys if you feel your dish needs a little extra oomph. 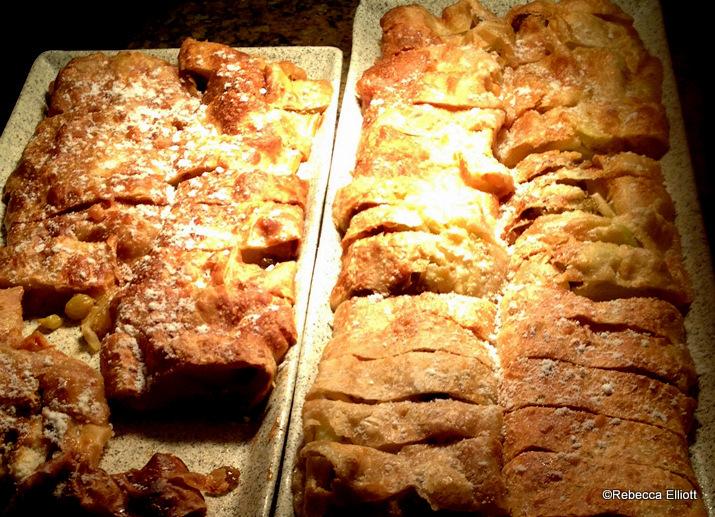 Just when we thought we couldn’t eat another bite, we sampled some desserts. There were many to choose from, including some traditional German delights like apple strudel and linzer squares (both delicious). 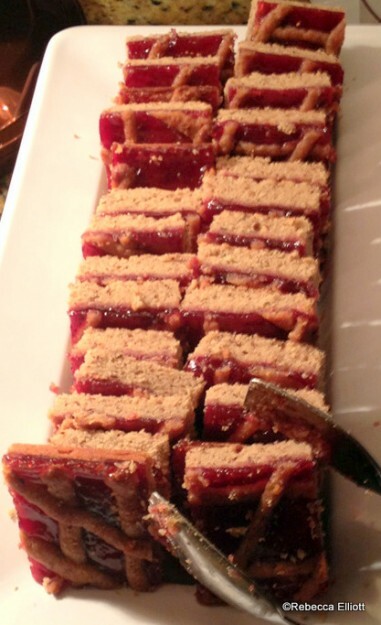 There were also shot glasses filled with Bavarian cream that could be topped with strawberry compote. My daughter loved those! Biergarten is a festive restaurant with an abundant selection of German-inspired dishes. 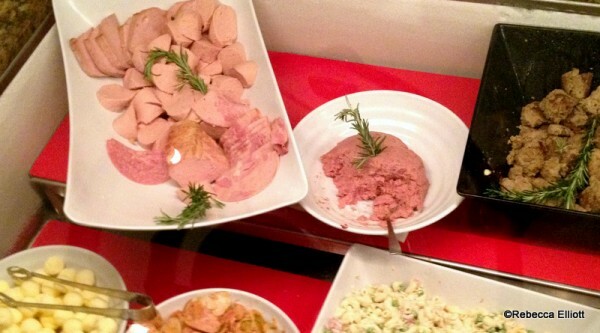 There is enough variety on the all-you-can-eat buffet for everyone to find something to enjoy. 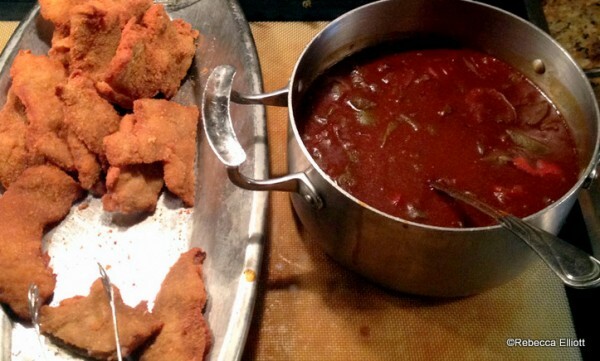 Our early reservation ensured the selections were well-stocked and the staff was friendly and attentive. The only challenge was not having any control over who was seated at our table, and we ended up with a couple of duds. If you are looking for a quiet, romantic meal, or if the thought of sharing a meal with people you don’t know is not your cup of tea, Biergarten is not your best choice. 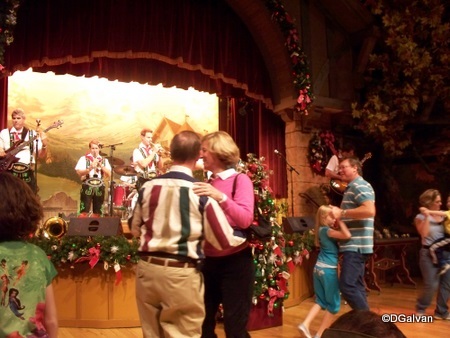 If you like polka music and have a penchant for schnitzel and spaetzle, you’ll have a great time! 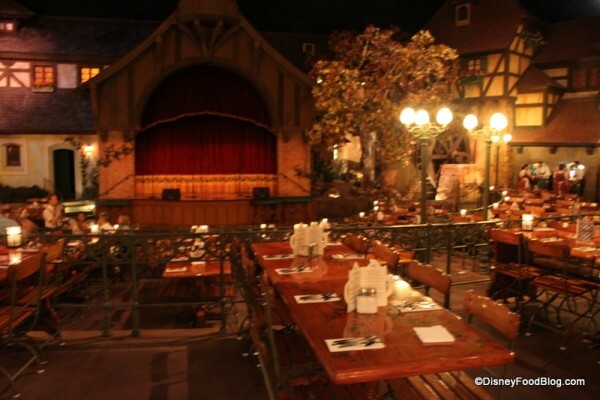 Has your family dined at Biergarten? Share your experiences in the comments below! Dude Problems: "You Should Shave Before We Go Out Tonight!" Schon seit mehreren Generationen begeistert Walt Disney viele Kinder und ganze Familien. Mit dem aktuellen Angebot von Buch.de könnt ihr euch den Family-Spaß im XXL-Paket nach Hause liefern lassen. Für 'Die gößten Animations-Hits' zahlt ihr dank eines 15-Prozent-Rabattcodes nur 101,99 Euro inklusive Versand. Die Box erscheint am 24. Oktober 2013 und ist mit 20 hochwertigen Blu-rays bestückt. Darunter sind einige Klassiker wie 'Der König der Löwen' und 'Das Dschungelbuch', aber auch neuere Movies wie 'Rapunzel - Neu verföhnt' und der Kultfilm 'Wall-E'. Die Box ist noch nicht auf dem Markt und schon beginnt der Kampf um den besten Preis. Laut Idealo.de lässt sich die Box andernorts erst wieder zum Bestpreis von rund 116,99 Euro bestellen. Nutzt ihr bei Buch.de den Gutscheincode NEU15, schrumpft der Preis auf schmale 101,99 Euro. Demnach könnt ihr schon vor dem Erscheinungstermin einen Vorteil von sehr guten 13 Prozent herausschlagen. Zudem habt ihr auch bei Buch.de die Vorbestellergarantie - sollte sich der Preis vor der Veröffentlichung zu euren Gunsten senken, zahlt ihr den niedrigeren Betrag. Freilich vergeht noch eine Weile bis Heiligabend, doch mit dieser Collection wäre man auch für das große Fest schon mehr als gut gerüstet. Für nur eine Blu-ray von Walt Disney zahlt man sonst gut und gerne 10 Euro. Ist es zudem noch die Diamond Edition, können die Preise pro Disc 15 Euro und mehr betragen. Sichert ihr euch 'Die größten Animations-Hits' über Buch.de in der Special-Edition, zahlt ihr pro Blu-ray umgerechnet nur rund 5 Euro! Vier der erfolgreichen Movies liegen obendrein als Diamond-Version bei. Mit dem aktuellen Angebot von Buch.de sichert ihr euch die Collection schon vor dem Erscheinungsdatum zum absoluten Bestpreis und profitiert zudem noch von der Preisgarantie - selbst im Falle einer Preissenkung des Artikels habt ihr keine Nachteile zu befürchten. 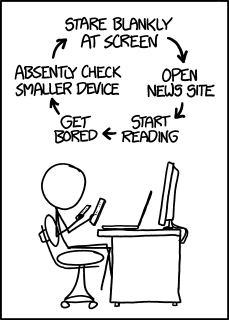 Der Code würde automatisch mit dem neuen Preis verrechnet werden. Eventuell ist in einigen Regalen daheim schon der eine oder andere Film aus der Collection vorhanden - aber auch in der Blu-Ray-Version? Vier Klassiker wurden komplett überarbeitet und als Diamond-Edition neu aufgelegt. Bei der Box handelt es sich um eine 'Limeted Edition' - allein die Verpackung ist schon ein Hingucker und die Bildqualität schlägt die der alten VHS-Videokassetten um Längen. Dass ihr die einzelnen Blu-rays in naher Zukunft noch einmal für rund 5 Euro pro Stück eintüten könnt, ist recht unwahrscheinlich.